If you do not find your question listed below feel free to submit a question. I have really bad credit. How can Stonebridge Auto Loans help? I’ve had a repossession less than a year ago. Will I still qualify? I’ve had a bankruptcy. Will I still qualify? I’m currently in a Chapter 13 Bankruptcy. Will I still qualify? Can I use an auto manufacturer’s employee discount (A-Plan, GMS)? At Stonebridge Auto Loans we use state of the art technology that evaluates your credit profile, income, and debt factors. Our process ensures that each application has the best possibility of approval prior to submission. And with a 93% approval record, if anyone can get you financed, we can! You must be a resident of the United States or Canada. You must have a verifiable gross (before tax) monthly income of $1500. Beyond these basic requirements, each loan application is then evaluated individually based upon the credit profile of the applicant and equity position of the vehicle being financed. The loan amount that you will qualify for is based on a number of factors, including but not limited to your current FICO score, your past credit history, and your monthly debt to income ratio. We use state of the art technology to determine the exact amount on an application by application basis. The down payment amount that you will need is based on a number of factors as well. However, most of our dealers have vehicles avaible with zero down payment finance options. Yes! Additional cash, however, may be required if there is a lien on the automobile that you are trading. The typical auto loan is for a new, one year, or two year old car with less than 50,000 miles. Nearly every vehicle financed is eligible for Extended Factory Protection so you won’t have to worry about unexpected repairs. If you’re shopping around for an auto loan or more credit, you should know that when creditors check your credit, it places an inquiry on your credit report. Inquiries can add up, which is often interpreted negatively by creditors. For this reason, too many inquiries can actually make getting an auto loan more difficult. If the repossession was not included in a bankruptcy and there is still a balance on the account, we can still help. Greater down payment requirements will apply and vehicle selection will be limited to newer cars that are still under factory warranty. Yes, Stonebridge Auto Loans can help. Yes. However, it may take longer to process your loan. You have to obtain an “Authorization to Incur Debt” from the trustee of your bankruptcy. This normally takes two to three weeks. Consult your bankruptcy attorney. I’ve never had credit before. Will I still qualify? Yes! 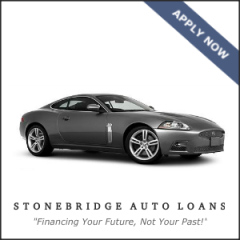 Stonebridge Auto Loans has several First Time Buyer Programs. Can I use Stonebridge Auto Loans to finance a vehicle through a private owner? No. Funds for loans through Stonebridge Auto Loans can only be used to purchase automobiles from dealerships with an Auto Loan Center onsite. Each dealer selected by Stonebridge Auto Loans has passed a rigorous screening for quality and customer service. This process ensures that each customer will purchase a dependable vehicle. When a vehicle is purchased from a private owner we have no way of determining the quality and dependability of the car. Yes! Let your Stonebridge Auto Loans Auto Loan Specialist know that you qualify for the discount and it will be applied toward your new car purchase. For Example: You decide to buy a new $40,000 Cadillac at a dealership without using Stonebridge Auto Loans. The dealer may keep submitting your application until it is approved or the dealer has exhausted all their lender resources. Your Stonebridge Auto Loans Auto Loan Specialist, on the other hand, will first determine if you qualify for the Cadillac. If so, your loan package will be submitted. If you don’t qualify you’ll find out without numerous inquires showing up on you credit report. Monthly payments are based on your credit profile and the vehicle you are purchasing. Newer, lower mileage cars qualify for extended terms. The best payments are on less expensive cars that have under 50,000 miles. A very good question for which there is not a direct answer. Rates are based on your credit profile and the equity position of the loan. Stonebridge Auto Loans is full spectrum. We will get you the best rate based on your credit profile. The higher your credit rating and down payment the lower your rates will be. Also, the model year of the vehicle plays an important role. Rates generally increase 1 point per model year. The older the car, the higher the rate. "To be honest you cannot beat the services or the people that I have dealt with. Thank you all so very much." Monthly income of at least $1,500. One year residence history is desired. One year employment history is desired. Chapter 7, 11 & 13 bankruptcies are allowed. The minimum age requirement for consideration is 18. For residents of Alabama and Nebraska it is 19. The phone number you provide should be your primary residence. You may use your cellphone if necessary. We will be sending you important information and confirmations throughout the loan process, so be sure to use a valid e-mail address. If retired: List Employer, Job Title and Length of Employment at company from which you retired. Your Total Monthly Income is the gross (before tax) amount of your income, and may include spouse's income, as well as income from any other verifiable source you have. List total from all sources. A bankruptcy filing will not preclude you from qualifying for credit. Your Date of Birth is required to verify your identity. Your Social Security number is required to verify your identity. Derric from MILWAUKEE, your loan application for $17,500 for the purchase of a used car from a dealer requires further action. We will be in contact. Harold from FRISCO, your loan application for $7,500 for the purchase of a new or used car from a dealer has been successfully placed. LISA from DOVER PLAINS, your loan application for a credit-based pre-approval amount for the purchase of a new or used car from a dealer has been successfully placed. Jessica from HAZLETON, your loan application for $10,000 for the purchase of a new or used car from a dealer has been successfully placed. Sheri from UNIONTOWN, your loan application for a credit-based pre-approval amount for the purchase of a new or used car from a dealer has been successfully placed. Masood from VALLEY STREAM, your loan application for a credit-based pre-approval amount for the purchase of a new or used car from a dealer has been received. Kelly from GEORGETOWN, your loan application for a credit-based pre-approval amount for the purchase of a used car from a dealer has been successfully placed. Ajit from FLORAL PARK, your loan application for a credit-based pre-approval amount for the purchase of a used car from a private party has been received. Nickles from HEMPSTEAD, your loan application for $5,000 for the purchase of a new or used car from a dealer has been received. EDWARD from HOWARD BEACH, your loan application for $20,000 for the purchase of a new or used car from a dealer has been successfully placed. Janelle from NEW ROCHELLE, your loan application for a credit-based pre-approval amount for the purchase of a new or used car from a dealer has been successfully placed. Javaughn from LIVERPOOL, your loan application for $17,500 for the purchase of a used car from a dealer has been successfully placed. Moreen from NEW YORK, your loan application for a credit-based pre-approval amount for the purchase of a new or used car from a dealer requires further action. We will be in contact. * Interest rates are nationwide averages for past week. OAC rates may vary. © 2005-2019 Stonebridge Automotive Financial, Inc. 4231 Balboa Avenue #1014 San Diego CA 92117 All Rights Reserved.